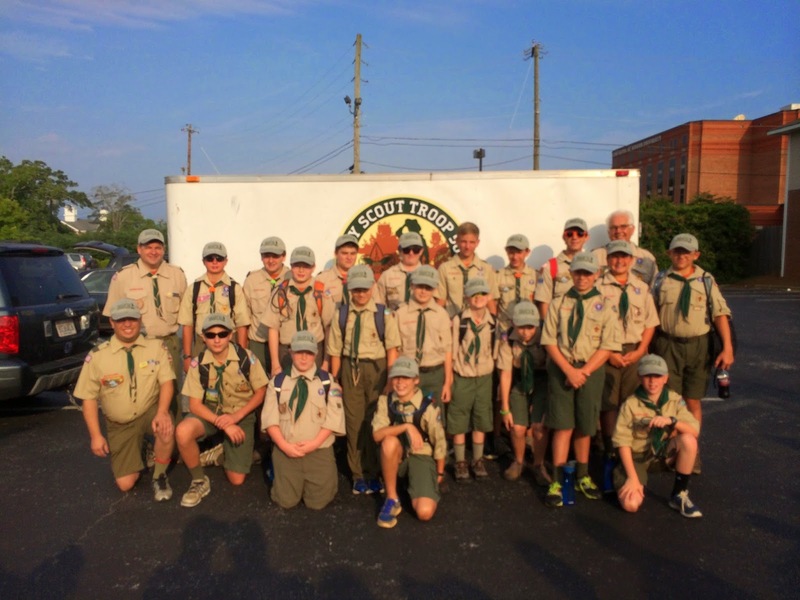 The troop gathers in Auburn before hitting the road to Camp Woodruff! A total of 19 scouts and four leaders left Auburn around 7:45 a.m. to make the trek to North Georgia. 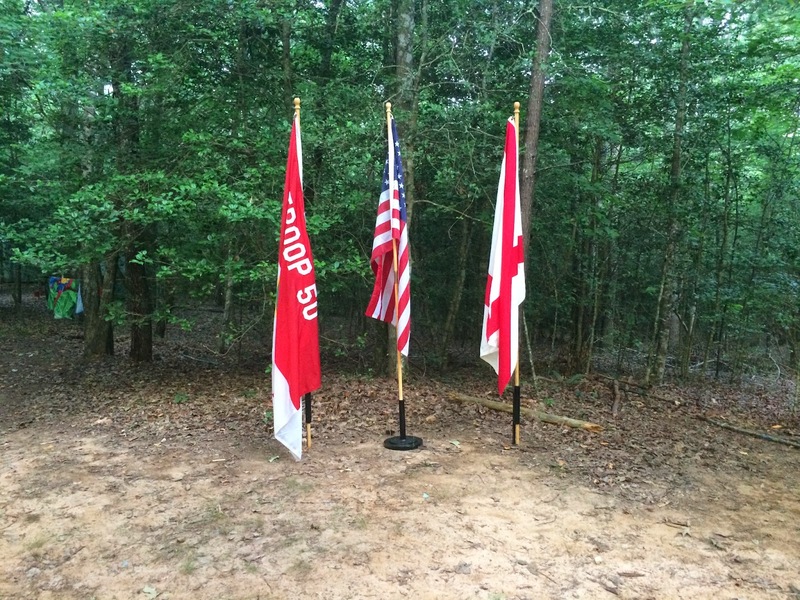 Woodruff Scout Reservation will be their home for the next week. Travel was quiet for some and a little noisy for others, but safe and timely for all. Everyone enjoyed a lunch at Papa's Pizza in Blue Ridge, Georgia before making the final drive into camp. We arrived at camp around 1:30 p.m. to begin the adventure. 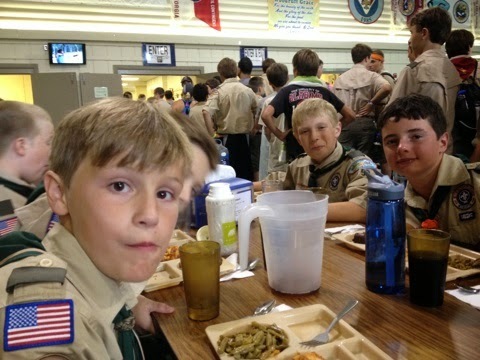 meal in the camp's dining hall. Scouts and leaders checked in, unloaded the trailer, and changed into their swimsuits for the swim test. The swim test line was a bit long, but everyone did well and we quickly got changed for dinner. 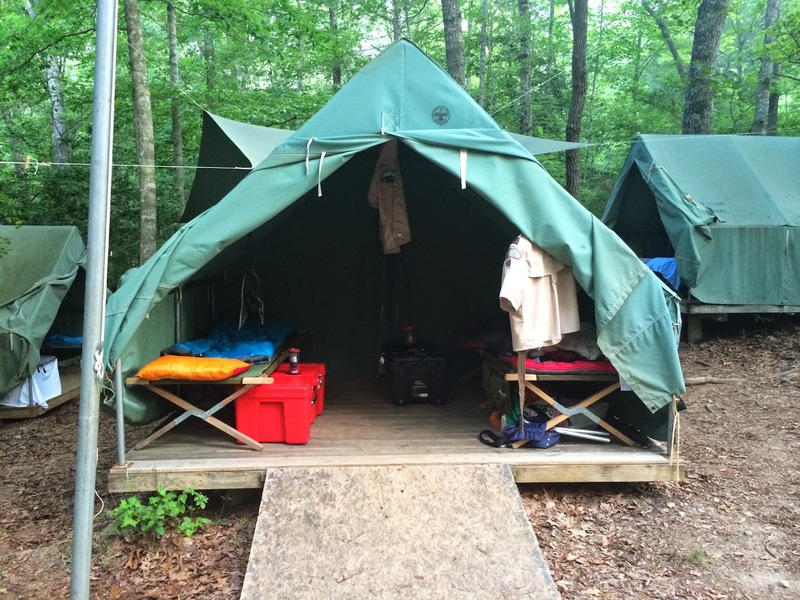 One leader was particularly more extended than the others and needed some quality time in the camp on his own. He recovered well, however. Dinner was a scrumptious serving of lasagna, green beans, and rolls. Of course, there was brownies for dessert, which was a favorite for the boys. After dinner, everyone attended the opening campfire where we got to meet the staff, sing songs, and in general be entertained. 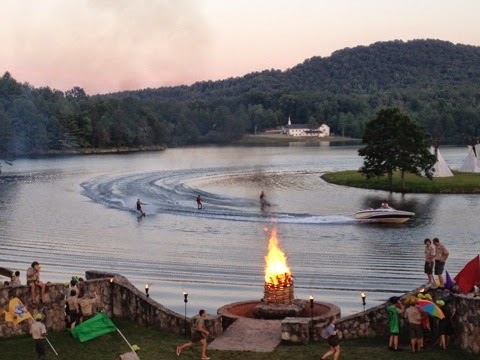 The camp performed a very impressive opening ceremony with water skiing, fireworks, state flags for each of the troops at camp, and of course a great bonfire! After the campfire, Scouts were briefed with some rules for the week and advice for camp logistics and everyone headed to bed. Everyone slept well and there were no requests to go home. Stay tuned for the Day Two blog later. To view pictures from Day One, please visit our online photo album.